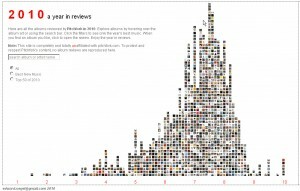 It features all the Pitchfork album reviews of 2010 arranged according to rating and it pops up images and links. I’m sure my statistician sister can tell you what the technical term is for this sort of presentation of data. I think it is “cool”. Be the first to comment on "Remarkable interactive infographics: Year in Reviews 2010 (P4K Edition)"